A newly released report suggests an estimated 200,000 people died during the swine flu pandemic of 2009. 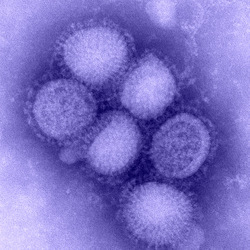 In April of that year, human infection with a new strain of H1N1 influenza, seen here, was confirmed in Mexico. Within weeks, human infections spread to the United States and cases begin occurring around the globe. As the world prepares for what may be the next pandemic strain of influenza virus – the H7N9 bird flu – Michael Ison, MD, associate professor in Medicine-Infectious Diseases and Surgery-Organ Transplantation, is helping develop the nation’s future plan of defense. Dr. Ison is co-chair of the antiviral section of a forthcoming revision to the Infectious Disease Society of America’s (IDSA) treatment guidelines for influenza. Created in the months before the 2009 “swine flu” pandemic, the IDSA guidelines are an evidence-based set of recommendations, assembled with contributions from many sources, including the Centers for Disease Control and Prevention and the American Academy of Pediatrics. Dr. Ison is also working to create new medicinal options. He was lead investigator of the phase II and one of two lead investigators of the phase III studies of Peramivir, a drug currently being evaluated by the Food and Drug Administration (FDA) for approval. 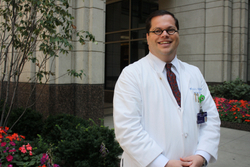 Michael Ison, MD, associate professor in Medicine-Infectious Diseases and Surgery-Organ Transplantation, is the protocol co-chair of an NIAID-funded study that hopes to validate virologic endpoints as a way to determine the effectiveness of newly designed antiviral therapies. Peramivir was used prior to FDA approval in 2009 as part of the nation’s Emergency Use Authorization plan because it can be delivered to individuals too sick to ingest oral or inhaled medication. As potentially the first FDA-approved intravenous treatment option to fight influenza, the drug could play a large role in future flu outbreaks. Dr. Ison recently published a study in Antiviral Therapy that demonstrated daily use of Peramivir was associated with clinical improvement during the pandemic. Over the past year, he and colleagues at the University of Toronto completed a first-of-its-kind study that looked at patients who developed influenza that became severe enough to require hospitalization. Those findings are pending publication and will provide insight into the clinical and virologic course of influenza in patients with severe infections. The IDSA guideline groups are currently reviewing literature, before recommendations are made and eventually approved sometime after the start of 2015. The new plans will rely on scientific investigation and expert opinion where data is limited. Vaccination remains the best method for preventing the flu.